Keeping aside all speculations, the Nagaland Government has appointed Renchamo P Kikon, the Additional Director General of Police (Law & Order), Nagaland, as the new Director General of Police (DGP) of the State. It may be mentioned that a signature campaign was started by Rupin Sharma’s junior colleagues in Nagaland demanding that Sharma be retained as the DGP of the State. 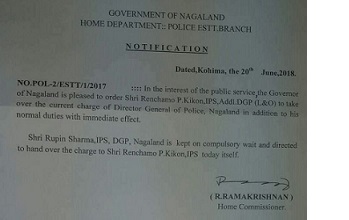 Through the order issued by Home Commissioner, Nagaland, R Ramakrishnan, the current Nagaland DGP, Rupin Sharma, has been kept on compulsory wait and he has been asked to hand the charge to IPS officer Kikon on Wednesday itself. In the order Home Commissioner Ramakrishnan also stated that the charge of the State DGP would be in addition to Kikon’s normal duties with immediate effect. Sharma, an IPS officer of Nagaland cadre, was serving as the acting DGP since November last. Rupin Sharma is an IPS officer of 1992 batch while Renchamo P Kikon is an IPS officer of 1998 batch. Renchamo P Kikon also served as the DG (Prison, HG & CD), Nagaland. It may be mentioned that Nagaland Chief Secretary Temjen Toy also reportedly wrote to the Union Home Secretary, requesting that Sharma be removed from the top post in the Police Department. Toy in the letter had mentioned that Sharma’s “inexperience led to challenges and issues in the conduct of the State Assembly elections in February”.